JOHN CARTWRIGHT BLOUNT was born 15 Sep 1829 in Washington County, Alabama, and died 10 Apr 1910 in Neshoba County, Mississippi. 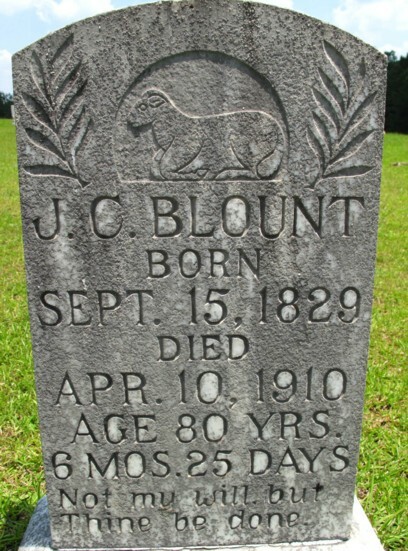 He was the second son of John Thomas Blount and Clarissa Ann Cartwright. He married SARAH M. KILPATRICK 28 Aug 1850 in Winston County, Mississippi (Source: Winston County, MS marriage records.). She was born 07 Dec 1831 in Alabama, and died 18 Jul 1901. Property 1: 01 Oct 1859, Land grant certificate #38.758, Ducument #53, Neshoba County, MS 39 84/100 acres. Property 2: 01 May 1860, Land grant certificate #407182, Ducument #270, Winston County, MS 83 12/100 acres. 2. i. MARGARET JANE4 BLOUNT, b. Abt. 1851, Mississippi; d. 1915.
ii. MARY FRANCES BLOUNT, b. 12 Oct 1852, Neshoba County, Mississippi; d. 18 Sep 1932. 3. iii. MARTHA VIRGINIA BLOUNT, b. 11 Jan 1854, Mississippi; d. 11 Mar 1898, Cross Plains, Callahan County, TX. 4. iv. JOHN PETER BLOUNT, b. 1856, Mississippi; d. 1946, Mississippi. 5. v. JAMES H. BLOUNT, b. 22 Nov 1857, Mississippi; d. 03 Feb 1930, Mississippi. 6. vi. WILLIAM ALEXANDER BLOUNT, b. Abt. 1859, Mississippi; d. Texas. 7. vii. SARAH ELIZABETH BLOUNT, b. 03 Oct 1861, Neshoba County, Mississippi; d. 12 Oct 1942, Cross Plains, Callahan County, TX. viii. CATHERINE C. BLOUNT, b. Abt. 1865, Neshoba County, Mississippi. ix. JOSEPH C. BLOUNT, b. 05 Jun 1866, Neshoba County, Mississippi; d. 15 Oct 1885, Mississippi. x. EDWARD T. BLOUNT, b. Abt. Sep 1869, Neshoba County, Mississippi; d. Abt. 1884, Mississippi. 8. xi. ROBERT M. BLOUNT, b. 03 Dec 1871, Neshoba County, Mississippi; d. 15 Feb 1929. 2. MARGARET JANE4 BLOUNT (JOHN CARTWRIGHT3, JOHN THOMAS2, FREDERICK1) was born Abt. 1851 in Mississippi, and died 1915. She married THOMAS JOHN MANNING Abt. 1869 in Neshoba County, MS. He was born 1848 in Alabama, and died Bef. 1910 in Mississippi. The 1910 census states that she has 12 children and 10 are still living. Only 11 have been accounted for. i. ALICE E.5 MANNING, b. Jul 1872, Neshoba County, Mississippi; m. J. A. TULLOS, 1905, Neshoba County, MS (Source: Neshoba County, MS Marriage Book D-161.). 9. ii. JOHN T. MANNING, b. Oct 1874, Neshoba County, Mississippi. 10. iii. JAMES MONROE MANNING, b. Abt. 1877, Neshoba County, Mississippi; d. 1945. 11. iv. MARY FRANCES MANNING, b. Jun 1880, Neshoba County, Mississippi. 12. v. SARAH A. MANNING, b. May 1883, Neshoba County, Mississippi. 13. vi. RUFUS FRANK MANNING, b. Apr 1885, Neshoba County, Mississippi. 14. vii. MARTHA EFFIE MANNING, b. Apr 1888, Neshoba County, Mississippi. 15. viii. ROBERT ALEXANDER MANNING, b. Nov 1890, Neshoba County, Mississippi. ix. WILLIAM EDWARD MANNING, b. Feb 1894, Neshoba County, Mississippi; m. FANNIE UNKNOWN; b. Abt. 1905, Mississippi. 16. x. JOSEPH C. MANNING, b. Mar 1895, Neshoba County, Mississippi. xi. ALMA J. MANNING, b. May 1898, Neshoba County, Mississippi; m. MITCHELL H. WELLS, 1919, Neshoba County, MS (Source: Neshoba County, MS Marriage Book I-101.). 3. MARTHA VIRGINIA4 BLOUNT (JOHN CARTWRIGHT3, JOHN THOMAS2, FREDERICK1) was born 11 Jan 1854 in Mississippi, and died 11 Mar 1898 in Cross Plains, Callahan County, TX. She married JAMES ROBERT MCGEE 1879 in Neshoba County, MS. He was born 03 May 1858 in Mississippi, and died 07 Jun 1954 in Coleman, Coleman County, TX. i. VIRGINIA ANN5 MCGEE, b. 11 Aug 1888; d. 02 Nov 1893, Cross Plains, Callahan County, TX. 4. JOHN PETER4 BLOUNT (JOHN CARTWRIGHT3, JOHN THOMAS2, FREDERICK1) was born 1856 in Mississippi, and died 1946 in Mississippi. He married ROSANNA VANNETTA WOOD 1882 in Mississippi. She was born 1856. 17. i. EDNA EARLE5 BLOUNT, b. 27 Apr 1883, Neshoba County, Mississippi; d. Oct 1979, Philadelphia, Neshoba County, MS.
ii. MARCELLA DANE BLOUNT, b. Abt. 1885, Mississippi; d. Abt. 1968, Mississippi; m. TRUMAN G. SALTER. iii. CURRAN W. BLOUNT, b. 07 Apr 1888, Neshoba County, Mississppi; d. Feb 1964, Mississippi; m. BESS M. UNKNOWN; b. 29 Jul 1891, Mississippi; d. Mar 1978, Hinds County, Mississippi. iv. CHARLES KIRK BLOUNT, b. Abt. 1897, Neshoba County, Mississippi; d. Abt. 1931, Mississippi. 5. JAMES H.4 BLOUNT (JOHN CARTWRIGHT3, JOHN THOMAS2, FREDERICK1) was born 22 Nov 1857 in Mississippi, and died 03 Feb 1930 in Mississippi. He married NANCY A. AYERS. She was born 1859.
i. HOLLIE JAMES5 BLOUNT, b. Abt. 1884, Mississippi; d. Abt. 1961, Mississippi; m. MARY DEVINE, Abt. 1920, Mississippi; d. Abt. 1932, Mississippi. 18. ii. HENRY ALEXANDER BLOUNT, b. Abt. 1888, Mississippi; d. Abt. 1977, Mississippi. 6. WILLIAM ALEXANDER4 BLOUNT (JOHN CARTWRIGHT3, JOHN THOMAS2, FREDERICK1) was born Abt. 1859 in Mississippi, and died in Texas. He married VIRGINIA ANN GIBBS Abt. 1880 in Mississippi. She was born in Alabama. 19. i. JOHN L.5 BLOUNT, b. Abt. 1884, Mississippi. 20. ii. WILLIAM ROBERT BLOUNT, b. Abt. 1885, Mississippi; d. Abt. 1935, Texas. iii. JOE B. BLOUNT, b. Abt. 1895, Mississippi. iv. MOLLIE L. BLOUNT, b. Abt. 1898, Texas. 21. v. JAMES ALEXANDER BLOUNT, b. Abt. 1899, Texas. vi. IDA L. BLOUNT, b. Abt. 1903, Texas. 7. SARAH ELIZABETH4 BLOUNT (JOHN CARTWRIGHT3, JOHN THOMAS2, FREDERICK1) was born 03 Oct 1861 in Neshoba County, Mississippi, and died 12 Oct 1942 in Cross Plains, Callahan County, TX. She married CHARLES BEAUREGARD MCGEE 1882 in Mississippi. He was born 10 Feb 1861 in Mississippi, and died 27 Jul 1940 in Cross Plains, Callahan County, TX. 22. i. LULA V.5 MCGEE, b. 13 Sep 1883, Mississippi; d. 14 Jun 1975, Karnes County, TX. 23. ii. JAMES CLINTON MCGEE, b. 02 Feb 1886, Mississippi; d. 24 Oct 1962, Eastland County, TX. 24. iii. CHARLES ALISON MCGEE, b. 11 Sep 1888, Mississippi; d. 20 Oct 1968, Baird, Callahan County, TX. 25. iv. JOHN F. MCGEE, b. 01 Mar 1891, Texas; d. 20 May 1950, Cross Plains, Callahan County, TX. v. MINNIE LEE MCGEE, b. 11 Aug 1892, Caddo Peak, Callahan County, TX; d. 1988, Cross Plains, Callahan County, TX. vi. CORA VIRGINIA MCGEE, b. Nov 1898, Callahan County, TX. vii. WILLIAM BUTLER MCGEE, b. 26 Nov 1900, Cross Plains, Callahan County, TX; d. 08 Nov 1967, Harris County, TX (Source: Social Security Death Index. ); m. WINNIE LEE DUNLAP; b. 12 Apr 1903; d. 12 May 1989, Harris County, TX. viii. MAUDIE MCGEE, b. Abt. 1903, Cross Plains, Callahan County, TX. 8. ROBERT M.4 BLOUNT (JOHN CARTWRIGHT3, JOHN THOMAS2, FREDERICK1) was born 03 Dec 1871 in Neshoba County, Mississippi, and died 15 Feb 1929. He married DORA M. JOHNSON 1896 in Neshoba County, MS. She was born May 1869.
i. ALBERT ANDREW5 BLOUNT, b. 11 Oct 1896, Neshoba County, Mississippi; d. Apr 1970, Neshoba County, Mississippi; m. MARY J. SISSON, Abt. 1925, Mississippi; b. 11 Jul 1899, Mississippi; d. Nov 1978, Neshoba County, Mississippi. ii. DEE A. BLOUNT, b. Jun 1898, Neshoba County, Mississippi. 26. iii. MARY E. BLOUNT, b. Nov 1899, Neshoba County, Mississippi. 9. JOHN T.5 MANNING (MARGARET JANE4 BLOUNT, JOHN CARTWRIGHT3, JOHN THOMAS2, FREDERICK1) was born Oct 1874 in Neshoba County, Mississippi. He married INA FORTENBERRY. She was born Abt. 1909 in Mississippi. i. ALMA L.6 MANNING, b. Abt. 1923, Neshoba County, Mississippi. ii. RICHARD MANNING, b. 1929, Neshoba County, Mississippi. 10. JAMES MONROE5 MANNING (MARGARET JANE4 BLOUNT, JOHN CARTWRIGHT3, JOHN THOMAS2, FREDERICK1) was born Abt. 1877 in Neshoba County, Mississippi, and died 1945. He married (1) FLORENCE M. ADCOCK 1899 in Neshoba County, MS (Source: Neshoba County, MS Marriage Book B-104.). She was born Abt. 1884 in Mississippi, and died Bef. 1920 in Neshoba County, Mississippi. He married (2) CYMA UNKNOWN Abt. 1927. She was born Abt. 1908 in Mississippi. i. WADE H.6 MANNING, b. Abt. 1901, Neshoba County, Mississippi; d. 1947; m. MYRTLE LEE COGHLAN, Abt. 1922, Neshoba County, MS; b. Abt. 1901, Mississippi. ii. LYDIA I. MANNING, b. Abt. 1908, Neshoba County, Mississippi. iii. ORPAL L.6 MANNING, b. 1928, Neshoba County, Mississippi. iv. OPAL E. MANNING, b. 1929, Neshoba County, Mississippi. 11. MARY FRANCES5 MANNING (MARGARET JANE4 BLOUNT, JOHN CARTWRIGHT3, JOHN THOMAS2, FREDERICK1) was born Jun 1880 in Neshoba County, Mississippi. She married ELLIS C. ADCOCK Abt. 1904 in Neshoba County, MS. He was born Abt. 1883 in Mississippi. i. MARY J.6 ADCOCK, b. Abt. 1905, Neshoba County, Mississippi. ii. THOMAS CHAPMAN ADCOCK, b. 20 Feb 1908, Neshoba County, Mississippi (Source: Social Security Death Index. ); d. May 1975, Camden, Madison County, MS.
iii. ELLIS E. ADCOCK, b. Abt. Jun 1914. 12. SARAH A.5 MANNING (MARGARET JANE4 BLOUNT, JOHN CARTWRIGHT3, JOHN THOMAS2, FREDERICK1) was born May 1883 in Neshoba County, Mississippi. She married CLINTON L. POPE 1911 in Neshoba County, MS (Source: Neshoba County, MS Marriage Book G-41.). He was born Jun 1888 in Mississippi. i. PRESTON6 POPE, b. Abt. 1912, Neshoba County, Mississippi. ii. GENOBIA POPE, b. Abt. 1915, Neshoba County, Mississippi. iii. BERNICE ESTELLE POPE, b. Abt. 1917, Neshoba County, Mississippi. iv. ELNORA POPE, b. Abt. 1921, Neshoba County, Mississippi. v. LEO POPE, b. Abt. 1924, Neshoba County, Mississippi. vi. CLINTON POPE, b. Mississippi. vii. RUDOLPH POPE, b. Mississippi. viii. ROBERT POPE, b. Mississippi. 13. RUFUS FRANK5 MANNING (MARGARET JANE4 BLOUNT, JOHN CARTWRIGHT3, JOHN THOMAS2, FREDERICK1) was born Apr 1885 in Neshoba County, Mississippi. He married NANCY E. TALLEY 1909 in Neshoba County, MS (Source: Neshoba County, MS Marriage Book E-215.). She was born Abt. 1884 in Mississippi. i. ELMA SUE6 MANNING, b. Abt. 1910, Neshoba County, Mississippi. ii. MARGARET LUCILLE MANNING, b. Abt. 1911, Neshoba County, Mississippi. iii. WILSON MANNING, b. 31 Dec 1912, Neshoba County, Mississippi; d. 07 Dec 1991, Philadelphia, Neshoba County, MS.
iv. MATTIE MANNING, b. Abt. 1913, Neshoba County, Mississippi. v. ROBERT E. MANNING, b. Abt. 1921, Mississippi. 14. MARTHA EFFIE5 MANNING (MARGARET JANE4 BLOUNT, JOHN CARTWRIGHT3, JOHN THOMAS2, FREDERICK1) was born Apr 1888 in Neshoba County, Mississippi. She married WILLIAM HENRY POPE 1904 in Neshoba County, MS (Source: Neshoba County, MS Marriage Book C-283.). He was born 1883 in Mississippi. i. EDGAR6 POPE, b. Abt. 1911, Neshoba County, Mississippi. ii. CLAUDIE POPE, b. Abt. 1915, Neshoba County, Mississippi. 15. ROBERT ALEXANDER5 MANNING (MARGARET JANE4 BLOUNT, JOHN CARTWRIGHT3, JOHN THOMAS2, FREDERICK1) was born Nov 1890 in Neshoba County, Mississippi. He married MARTHA ADA WHINERY 1911 in Neshoba County, MS (Source: Neshoba County, MS Marriage Book G-24.). i. WILSON6 MANNING, b. Abt. 1912, Neshoba County, Mississippi. ii. ELSIE MANNING, b. Abt. 1918, Neshoba County, Mississippi. 16. JOSEPH C.5 MANNING (MARGARET JANE4 BLOUNT, JOHN CARTWRIGHT3, JOHN THOMAS2, FREDERICK1) was born Mar 1895 in Neshoba County, Mississippi. He married AUDIE SPEARS Abt. 1918 in Neshoba County, MS. She was born Abt. 1903 in Mississippi. i. CURTIS6 MANNING, b. Abt. 1919, Neshoba County, Mississippi. ii. COY C. MANNING, b. Abt. 1920, Neshoba County, Mississippi. iii. RUPERT J. MANNING, b. 1929, Neshoba County, Mississippi. 17. EDNA EARLE5 BLOUNT (JOHN PETER4, JOHN CARTWRIGHT3, JOHN THOMAS2, FREDERICK1) was born 27 Apr 1883 in Neshoba County, Mississippi, and died Oct 1979 in Philadelphia, Neshoba County, MS (Source: Social Security Death Index.). She married JAMES RUSH BARRETT. i. EDNA ERLE6 BARRETT, b. Abt. 1914, Mississippi. 18. HENRY ALEXANDER5 BLOUNT (JAMES H.4, JOHN CARTWRIGHT3, JOHN THOMAS2, FREDERICK1) was born Abt. 1888 in Mississippi, and died Abt. 1977 in Mississippi. He married (1) FLORENCE GRAVES Bef. 1920. He married (2) OLA HURST Abt. 1920.
i. CARL H.6 BLOUNT, b. Abt. 1930, Mississippi. 19. JOHN L.5 BLOUNT (WILLIAM ALEXANDER4, JOHN CARTWRIGHT3, JOHN THOMAS2, FREDERICK1) was born Abt. 1884 in Mississippi. He married DOVIE LOVE MORGAN. i. CHARLIE E.6 BLOUNT, b. Abt. 1911, Texas. ii. HAZEL I. BLOUNT, b. Abt. 1921, Texas. iii. JAMES BLOUNT, b. Abt. 1922, Texas. 20. WILLIAM ROBERT5 BLOUNT (WILLIAM ALEXANDER4, JOHN CARTWRIGHT3, JOHN THOMAS2, FREDERICK1) was born Abt. 1885 in Mississippi, and died Abt. 1935 in Texas. He married GOLIAD UNKNOWN. i. ROBERT6 BLOUNT, b. Abt. 1927, Texas. 21. JAMES ALEXANDER5 BLOUNT (WILLIAM ALEXANDER4, JOHN CARTWRIGHT3, JOHN THOMAS2, FREDERICK1) was born Abt. 1899 in Texas. He married LILLIE EULA NASH. i. NEVA JANICE6 BLOUNT, b. Texas. ii. VIRGINIA ANN BLOUNT, b. Texas. 22. LULA V.5 MCGEE (SARAH ELIZABETH4 BLOUNT, JOHN CARTWRIGHT3, JOHN THOMAS2, FREDERICK1) was born 13 Sep 1883 in Mississippi, and died 14 Jun 1975 in Karnes County, TX (Source: Social Security Death Index.). She married MILTON PRESTON ARMSTRONG 1905 in Callahan County, TX. He was born 29 Feb 1880 in Texas, and died 14 May 1969 in Karnes County, TX. i. MABEL6 ARMSTRONG, b. Abt. 1906, Callahan County, TX. ii. EDNA ARMSTRONG, b. Abt. 1908, Callahan County, TX. iii. NORA N. ARMSTRONG, b. 1909, Callahan County, TX. iv. RAYMOND ARMSTRONG, b. Abt. 1915, Texas. v. GARLAND ARMSTRONG, b. Abt. 1920, Texas. vi. GIRTIE ARMSTRONG, b. Abt. 1920, Texas. 23. JAMES CLINTON5 MCGEE (SARAH ELIZABETH4 BLOUNT, JOHN CARTWRIGHT3, JOHN THOMAS2, FREDERICK1) was born 02 Feb 1886 in Mississippi, and died 24 Oct 1962 in Eastland County, TX. He married MINNIE BELL CAVANAUGH. She was born 24 Mar 1888 in Missouri, and died 26 May 1988 in Brownwood, Brown County, TX. i. LILLIE BELL6 MCGEE, b. 24 Aug 1905, Callahan County, TX; d. 25 Apr 1996, Eastland County, TX; m. MELVIN OWEN BROWN, 1930, Texas; b. 06 Jun 1908; d. 06 May 1979, Coleman County, TX. ii. MERTIE MELROSE MCGEE, b. Abt. 1908; m. JOHN FRANKLIN BROWN, 1929, Texas. iii. ROBERT LEE MCGEE, b. 11 Jan 1911, Callahan County, TX; d. 06 Sep 1982, Taylor County, TX. iv. CHARLIE JACKSON MCGEE, b. Abt. 1913, Texas; d. 06 Jan 1989, Brown County, Texas (Source: Texas Deaths 1964-1998.). v. VIOLA CHRISTEEN MCGEE, m. UNKNOWN HILL. 24. CHARLES ALISON5 MCGEE (SARAH ELIZABETH4 BLOUNT, JOHN CARTWRIGHT3, JOHN THOMAS2, FREDERICK1) was born 11 Sep 1888 in Mississippi, and died 20 Oct 1968 in Baird, Callahan County, TX (Source: Texas Deaths 1964-1998.). He married RACHEL E. WINGFIELD Abt. 1910 in Callahan County, TX. She was born 09 Oct 1894 (Source: Social Security Death Index. ), and died 27 Mar 1992 in Callahan County, TX. i. VADA LUCILLE6 MCGEE, b. Abt. 1918, Callahan County, TX. ii. TRICIA O. MCGEE, b. Abt. 1920, Callahan County, TX. 25. JOHN F.5 MCGEE (SARAH ELIZABETH4 BLOUNT, JOHN CARTWRIGHT3, JOHN THOMAS2, FREDERICK1) was born 01 Mar 1891 in Texas, and died 20 May 1950 in Cross Plains, Callahan County, TX. He married MOLLIE WINGFIELD Abt. 1910 in Callahan County, TX. She was born 03 Jun 1890.
i. LORENA6 MCGEE, b. Abt. 1913, Callahan County, TX. ii. LORA MARIE MCGEE, b. Abt. 1915, Callahan County, TX. iii. DESSIE MCGEE, b. Abt. 1916, Callahan County, TX. iv. DORSIE MCGEE, b. Abt. 1918, Callahan County, TX. v. JOHNIE MCGEE, b. Abt. 1923, Callahan County, TX. vi. DONA MCGEE, b. 1926, Callahan County, TX. 26. MARY E.5 BLOUNT (ROBERT M.4, JOHN CARTWRIGHT3, JOHN THOMAS2, FREDERICK1) was born Nov 1899 in Neshoba County, Mississippi. She married ARNOLD ADCOCK. He was born Abt. 1912 in Mississippi.